I thought I was done with my cookie baking- I really did. In fact- I had big plans to not bake anything until Christmas Eve so I could give my body a bit a of a break from the sweets. (you know- so I don’t end up with an 11 lb. baby…) But then- I felt an impulse to bake some cookies to send with my sisters who left today for Wisconsin for Christmas. It’s my first year in my 30 years to not be with my family, but the rest of the NYC crew is actually taking a fun road-trip home and I wanted to give them some treats for the journey. I made a batch of these last night,without the intention to blog them, (you see I had a whole different post planned for today,) but they were so good and so incredibly easy that I had to wake up early just to snap pictures before sending them with the sisters. (And then when Andy got home last night and heard that he was only allowed one of these as I was sending the rest, he promptly ran to the store to buy me more flour so I could make him his own batch.) You guys need this recipe. These cookies are so delicious and exactly what I wanted. They are crackly and crispy edged, with super chewy middles and lots of molasses flavor. Plus I used olive oil in them instead of butter so that makes them kinda healthy right? Also- after sharing two fancy recipes this week- I felt the strong need to give you one more easy as pie recipe before your holiday baking is over. If you want to add one more cookie variety to your spread- these can be baked and done in no time. Seriously- they are the easiest. I’ll share my last recipe for a festive Christmas breakfast on Monday and then take a few days off to enjoy a quiet NYC Christmas with Andy while we’re still a party of two. Have a great weekend! 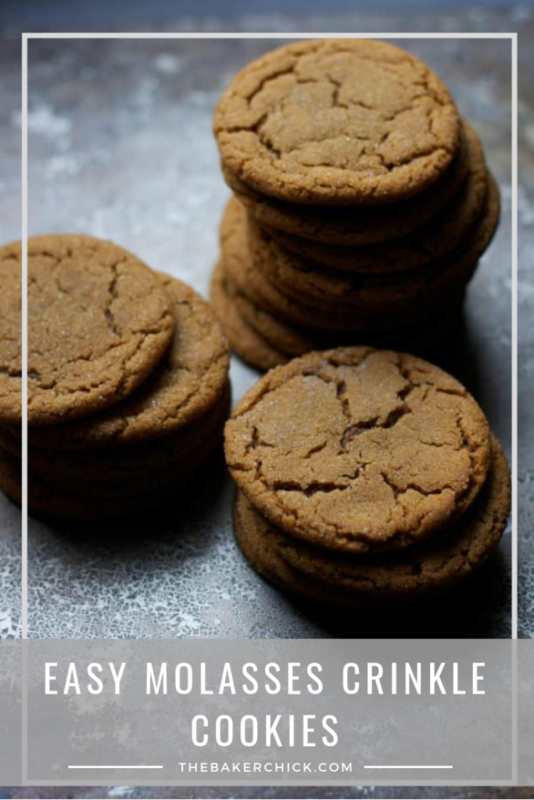 These easy molasses cookies are perfection- crispy edges, chewy middles, and full of rich molasses and ginger! Preheat oven to 350. Prepare a baking sheet with a silpat or parchment paper. Set aside. In a large mixing bowl, combine oil and sugars, whisking until smooth. Add molasses, vanilla and egg and whisk until well-combined. Sprinkle the spices, baking soda and flour over the wet ingredients and fold together gently using a spatula or wooden spoon. Either just scoop dough onto the cookie sheet 2-3 inches apart and bake as is, or roll 1 1/2 inch sized balls in sugar and place onto the cookie sheet. Bake for 8-10 minutes until the edges are set and the middles are cracked. Place cookies a piece of wax paper to cool. Cookies will stay chewy for up to a week in an air-tight container. *I used light olive oil the first time I made these and then made a second batch with half light olive oil and half coconut oil. They tasted great both ways, but I think light olive oil or other vegetable oil gives a much more cracked appearance. 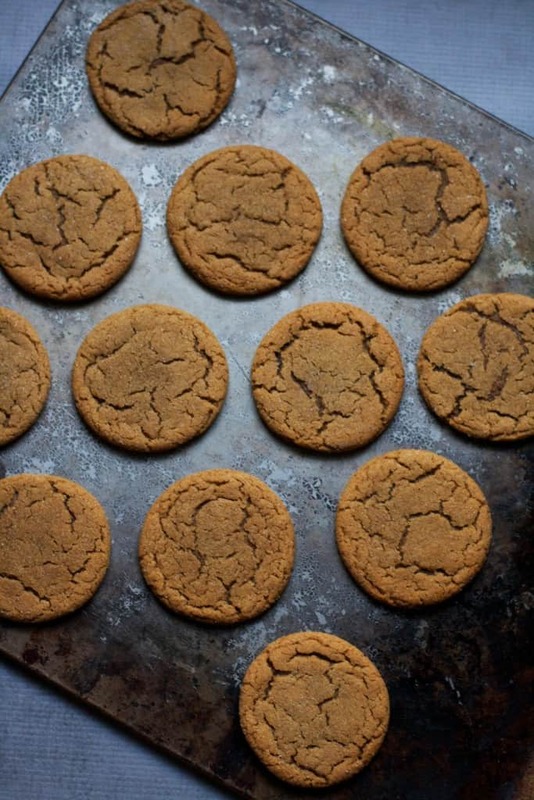 **These cookies aren't overly spicy letting the molasses flavor shine. If you want more spice use heaping teaspoons of the ginger and cinnamon. I seriously need a break from sweets, but these sound too perfect not to try! I really thought I hit the point of cookie burnout early this week. And, I was sure I was done with cookie baking for the year…….but, you’ve just persuaded me to make one more batch! These look delish! I can almost smell these!!!!!!!!!!!!!!! These are one of my all time favorite cookies! Love it! These look so perfect and holiday-ish :) I definitely need to make these this week, for Christmas! Yummy. Thanks Baker Chick. There were still a few left when the gang arrived home last night, and you are right – these are fantastic. Thanks so much for sending. These remind me of my most favorite cookies at starbucks, which we dont have in the Netherlands. Pinned!! Just made these cookies – the recipe is spot on! I agree the molasses flavor is dominant, but hey – they are molasses cookies! Love the gorgeous crinkle on top – I rolled mine in vanilla sugar before baking and added some chai spice to the dough! The texture is crispy on the edges and slightly chewy in the center. Can’t wait to have another one with my coffee in the morning! totally loving this recipe, and now, too, your blog! thanks for sharing – you’ve got a new fan! GORGEOUS cookies! I neeeed to get myself some molasses! I think this is my new favorite cookie recipe! Thank you so much, Baker Chick! 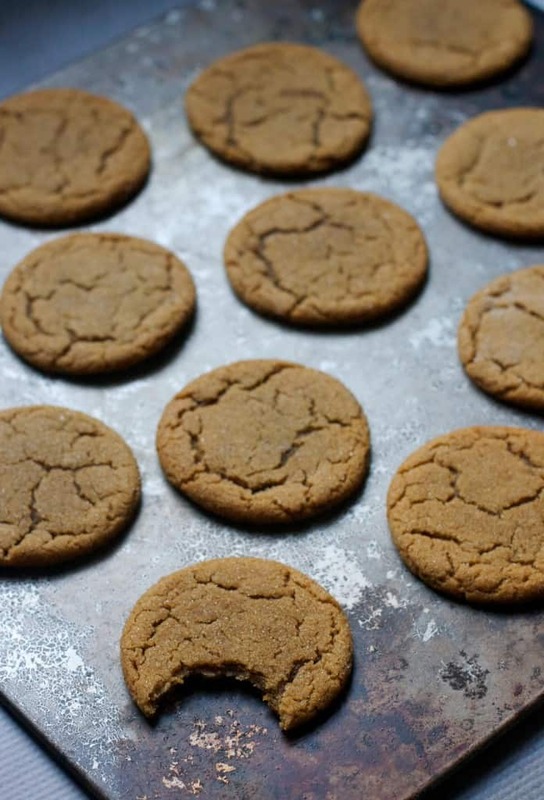 I have my great-grandmother’s molasses cookie recipe which is also incredible, but requires so much time… wax paper, kneading, refrigerating, rolling pin! BUT I made your recipe in 30 minutes, and they were the perfect mix of chewy and crispy! WOW! Audra, do you do these one sheet at a time or 2 and rotate? Thanks! Just made another batch and this time with cardamom powder! Thank you for the recipe. Could I ask, what type of Molasses did you, or do you, use? Not necessarily the name brand, but if it’s unsulphered, black strap, light or regular molasses. 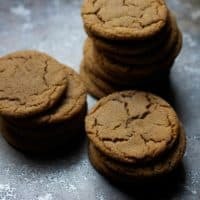 I have been looking for the perfect molasses cookie recipe, and I think this might just be it. Now to bake them, but I would like to use the same type of molasses you used. In advance, thank you for your help. Also, as someone else asked, can two pans, or just one, be used in the oven while baking? Thank you so very much for the help. :) I am going to get going on making these tomorrow morning and can’t wait! :) Merry Christmas to you and your family. These are very good! Just made them, but I cut both sugars in half and used olive oil for the oil to make a little healthier. I used all organic ingredients too, including organic whole wheat flour. 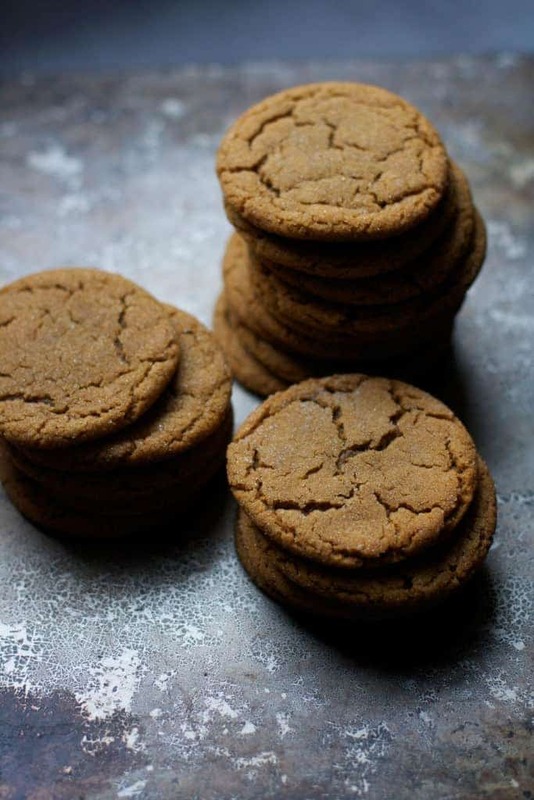 These totally crushed my pregnant ginger molasses cookie craving! I made these again for Christmas this year, and I got so many amazing compliments on them! I used coconut oil and added the extra ginger. I will be making them again! Thanks for the great recipe! Made this recipe and they were perfect. Roll into larger balls as to have them chewier. Too die for, highly recommend. Making my 3rd batch tonight!! Holy moly, these are amazing! Rolled some in apple-cinnamon sugar, some in pumpkin pie spice sugar, and kept some plain. Subtle but noticeable differences in all three. All three incredible. Will definitely be making these again. Thanks Audra! Where do you buy apple cinnamon sugar, vanilla sugar and pumpkin pie spiced sugar? Can I use Mrs. Schlorers turkey molasses?